"A great change to the usual grilled burgers. These burgers are stuffed with ham, cheese, mushrooms, and onions then slow grilled. Grill over hickory or mesquite wood if possible for better flavor! A sure family pleaser!" Preheat a grill for high heat. When the grill is hot, lightly oil the grate. In a large bowl, mix together the ground beef, Worcestershire sauce, hickory seasoning, salt and pepper until well blended. Make 20 balls, and flatten into patties. On one half of the patties, distribute the onions, mushrooms, ham and cheese. Carefully cover the piles with the remaining patties, making sure to seal all of the edges of the patties together tightly and enclose the filling. Grill the patties for 8 to 10 minutes per side, or until meat is well done, and cheese in the center is melted. These may be the most flavorful grilled burgers ever. The recipe has been corrected to make smaller burgers. I was really disappointed after reading all the great reviews. This didn't taste any different from a plain old burger. These burgers turned out perfect. I added some monterrey jack cheese to the mixture and left some without onions. Will grill these again maybe stuffed with swiss cheese and canadian bacon! 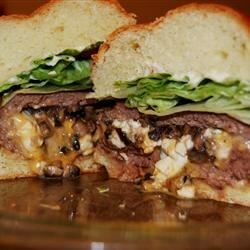 Used this recipe with onion, mushrooms and blue cheese and it was wonderful. Used crisp cooked bacon pieces instead of ham, used Swiss cheese then added a slice of Provolone on top. These were awesome, but they were HUGE! I could only eat 1/2 of one. My husband loved them, and is able to eat a whole one! Thank you for the recipe! Very tasty. Scaled down ingredients so not such big portions. Added fresh chilli & chilli powder instead of hickory. My husband loved this burger "the king burger". Will make again.